I sometimes cry in my show! I have 280 FIVE ★★★★★ REVIEWS!!! So many WONDERFUL Reviews!!! Bumbling Bert is awesome for your Childrens' party! Specializing in ONLY kids magic & entertainment. Within seconds, however, his hilarity and bumbling will fill the room with bursts of giggles and spontaneous chortles of laughter. Utterly enchanted, your guests will be hollering out tips and clues to let Bumbling Bert in on the magical secrets they see unfolding before them. But not so fast! Just when you think you've got him figured out, 'A-BERT-ca-da-bra!' Bumbling Bert will shock and amaze the entire crowd by producing awe-inspiring illusions. Our daughter loved it. What else can you ask for? We had BB for a birthday party for a 4-year old (children attending ranged from 3 to 7 years). He was great. His superpower isn't his magic (which is entertaining for kids but not mind-blowing), it's his ability to deal with kids. The kids loved basically everything he did. He doesn't pander to them, but he knows what they are going to like and he kept them occupied for the whole time. We've had paid entertainers for our daughter's 2nd, 3rd, and now 4th birthdays, and BB was by far the best. Kudos to Bumbling Bert. Amazing! Bert kept the kids and parents totally engaged the entire 90 minutes! So funny for all ages. He adapts to everyone so easily! Totally recommend! Bumbling Bert was amazing! We had twenty something 5 year old's, all hyper boys, except for 2 girls, who were so excited by his tricks and jokes that they were swarming Bert every few minutes or so, but he always managed them perfectly without appearing flustered at all! The children loved the show and many parents came up to us after to ask where we found such a good entertainer! He even demonstrated the magic kit to the children and they were all playing the with the kit right after. Balloon twisting was also great and he made sure there was enough time for both the magic and the balloon twisting. Very professional communication throughout. Thank you, Bert! We loved the whole experience since the booking until the show was done.!!! No complaints at all. Everything was easy going and professional. And the most important was that kids had a lot of fun and laughed a lot. We are pleased to recommend the show for your party. Bert was amazing. He arrived on time and from the moment he arrived he had captured the attention of the kids. I was worried an hour may be too long, but they all loved it. Was great!! I also got the loot bags as an add on and was worried they would be very cheap and generic, but was pleased that it was not your typical items. Overall, very impressed - would recommend and use again! Entertaining for both kids and adults. Very comedic and has a way of captivating his audience. Highly recommend him for a kids party. Community Dance plus Magic show!!! Can I give 6 stars?!?! We had Robert DJ our annual family valentines dance! Over 120 kids and their parents enjoyed an evening filled with music, dancing and we also added on the magic show option! It was a wonderful community event and we raised lots of money for our community daycare. Robert was professional, polite, fair priced, well equipped, knowledgeable, and most important, Fun! Thanks Robert... can’t wait to have you back next year. Thank you so much! You essentially made my son's 5th Birthday incredibly memorable for Both the kids And Parents. To say I would recommend Bert is the understatement of the year. We will see you next year! It was amazing, the kids had so much fun! It was so entertaining and funny. One hour of fun and entertaining!!!! Wow! The kids and adults enjoyed Bert JR’s show sooooo much! If you are even considering adding the disco dance party - DO IT!! Definitely a highlight! Although the whole hour was exciting. I love how the birthday girl was so involved in the show. Bert JR included her in almost all the magic. She will never forget her 7th birthday and I’m sure her friends won’t either! Thanks for everything- and the little magic wands were the perfect giveaway. Kids loved them! Excellent! 4 year old son loved it! I booked Bumbling Bert the day before my sons party due to the entertainment I had reserved canceling on me last minute (very disappointed). Not only did they accommodate all my requests on such last minute, they went over and beyond to ensure my sons party would be excellent! On the day of the party, he was able to engage kids of all ages! The laughter was contagious! My son and his friends absolutely loved it. Parents were all impressed. Please book with them, don’t second guess it - they are excellent! I never write reviews but I just had to! We hired Bumbling Bert for party entertainment -- it was great! Excellent communication from booking to the event. Always quick to respond to emails and the show itself was great for the kids and adults. 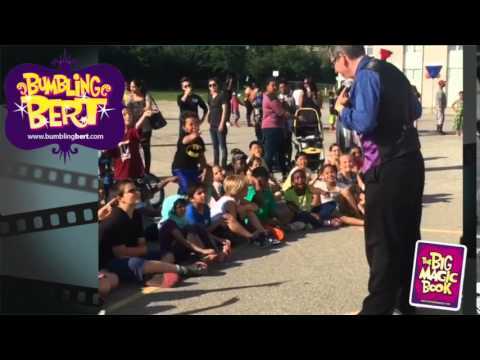 Sillier tricks for the younger kids and some great close-up magic for the adults. We would definitely hire Bumbling Bert again. Bert had us all spellbound and laughing hysterically. Kids absolutely loved him and have been talking about him ever since. Lots of opportunities for kids to be part of the show. And it was hilarious for the adults, too. Super professional and friendly. Such a great decision to have Bert at our party. We were super lucky to have Bumbling Bert for our daughter's 8th birthday party! The birthday girl was the star, yet the remainder of the kids felt equally engaged! Bert is amazing at connecting with the kids and "reading" the kids, his interaction with them so much fitted their individual personalities -- it was as if he knew them before he came! My husband and I were watching "from the sidelines", and we couldn't stop laughing either. Highly recommended! Bert aka Scott is an excellent Magician. We had him for our daughter's 1st bday party. He engaged the kids from dancing, and following his instructions on games. All of the kids laughed at his jokes and tricks and even adults too. Very entertaining and organized from start to end. We had him for 2 and half hrs. From performing magic tricks,balloon twisting, games, DJ, emcee and a little bit of bubble show. All I can say is its all worth it . Our guests were raving on how the kids had a blast and some parents already asked on how they can reach him for their kids bday party. Will definitely hire him again. Second year in a row that Bert has provided the best entertainment for our birthday party. He is amazing at dealing with different ages and keeping everyone entertained (including adults). Fantastic show, the kids were mesmerized. Everyone was giggling like crazy. All of the children were engaged and feeling comfortable enough to join in. Well worth the money and I would definitely use him again and recommend to others. The kids had a blast!!!! We had about 20 some odd kids ranging from 1-13. They all had an amazing time! Thanks Bert! Mona is already asking for you for next year!! Bumbling Bert was a huge hit with the kids. His energy was amazing! Highly recommend!! Robert is outstanding at my Son's birthday party. Even after reading all the good reviews, I had my doubts. But Robert, within 2 mins grabbed the attention of about 12 kids (4-10 yr old) and had their attention for 45 mins non-stop. Anybody can do magic tricks but the way Robert presents them to the kids, the way he interacts with them and makes them laugh all along is just superb. He even manages some over-active kids very well. If you are looking for a birthday magician, get Robert, you can never go wrong. He has the personality and aura to make kids like him. Excellent performance had both the kids and parents at my sons fourth birthday in stitches! So funny. Very age appropriate. Bumbling Bert arrived on time and kept the kids entertained for the most part. We had a big range of kids (ages 3-12), and some of the older ones didn’t enjoy as much as the younger ones did. I think that all would have loved to see a few more magic tricks. They all had a great time and B.B. was a great addition to their last day of School. Thank you Bumbling Bert. Have a wonderful summer! Amazing job entertaining kids and adults at 4th birthday! So glad we got the loot bags too..they were a hit! All the kids really enjoyed the show that Bert performed at my daughter's 6th b-day party! They were so excited and he made a very good connection with kids. My favourite part was the dance party after the show. Thanks Bumbling Bert for making my daughter's b-day one of a kind! Both kids & parents enjoyed it. Loot bags were great. My daughter wished bumbling bert had stayed to play with her after party. He was amazing. We all had a great time with Bert. I would definitely recommend him to anyone. Daughter's 2nd Birthday Party with Bert! Honestly, the best experience I have ever had with an entertainer of any kind! Bert was INCREDIBLE! The kids AND adults loved him! Everyone was involved in his show - my 2 year old wouldn't take her eyes of him the entire time! There were kids ages 2 - 7 at the party and all of them were entertained for the full hour! Every child let loose at the end and danced! Please, consider Bert for your event, you will not be disappointed! Bert was a fantastic entertainer! Extremely professional form a get go with the booking, and calling to confirm. He had a fantastic program, engaged every child. Children were very happy and so were their parents. I would highly recommend him. I would also do not hesitate to hire him again. He was a pleasure to have at our party! Great entertaining performance for kids and adults! Buy far the best magician out there!!! The kids and adults all loved the show...entertaining from the moment he walks through the door!! Will definitely be using them for future functions! Entertained a dozen kids with laughs and magic in our home. Great show. My 6 year old daughter is usually shy and does not want to engage but with Bumbling Bert she was giggling all the time and had so much fun! Bert made her feel really special and a star of the show! After her birthday party she kept saying that she wants to do magic every day! Bumbling Bert did a fantastic job! The kids loved the performance! Awesome time! A great event for the kids and adults! We had so much fun! The kids and adults never stopped laughing the whole time! Well done! It was very entertaining! Kids were engaged and happy! Thank you! The kids at my son's 6th bday party loved him. He did a 30-minute hilarious magic show, involving the kids, then taught them a trick, then made balloon animals. The birthday boy never stopped laughing and smiling and rolling on the floor with glee. A huge hit. I definitely recommend! We hired Bumbling Bert for my sons 5th birthday party and he was wonderful. He was funny, entertaining and kept all of the tricks and jokes to an age appropriate level. We would definitely recommend him! He is really good. Kids love him. Every minute is fun. I strongly recommend. Bumbling Bert definitely exceeded expectation, we all had a great time! Kids and adults included! We loved every minute of the show. AMAZING!! I never expected for the kids to have so much fun! The adults were also entertained too!! Bert was amazing! We all enjoyed his magic tricks. His balloon making skills were fantastic!! Awesome! Thanks so much Bert. Robert came recommended already, but the recommendation did not do him justice. He arrived, set up in less than a minute and then held the attention of 12 five-year-olds for the next half hour. His tricks are great, but it is his focus on the kids and immediate rapport that really made it special. Anyone can do a bit of magic, but Robert's gift is to really bring that magic. The kids laughed, whooped and gasped - as did many of the grown-ups - and when it came to the end, the cool down was fantastic - Robert demonstrates a couple of tricks for the kids, to show them how it's done. His explanation is clear, easy to follow, and many of the kids began to try them right away. Bumbling Bert did such a fantastic job at our kids Christmas party today. Lots of great magic and lots of silly jokes that had both kids and adults laughing aloud. He kept us all entertained for the full 45 minutes. Great professional setup and absolutely loved his online booking system. So easy to use. And, each child got a special gift to take home after the show which thrilled them. I look forward to using Bert again soon! Amazing and hilarious magician for any age! Robert truly was a huge success at our sons 3rd Birthday party! He had the children and the adults entertained with his magic tricks and jokes the whole time. He knows exactly what to do to get the more shy children to participate. Worth every penny! Highly recommended! The energy and enthusiasm was impressive. Bert was excellent with the kids and the adults got a great kick out of it as well. My 4 year old son and his friends really enjoyed the show. We hired Bumbling Bert for our daughter's 4th birthday party and we were so thrilled. He brought loads of energy and lots of tricks up his sleeve and he had the children roaring with laughter! His loot bags were a big hit too... I would certainly recommend him to my friends and I look forward to seeing him again at future parties! AMAZING! On time, super communicative leading up to the party and had the kids and adults in stitches!!! Highly, highly recommend! Bert performed at our seven year old's birthday party and it was so much fun! We highly recommend him! I had no idea who to have come for my son's 7th birthday when he asked if he could have a magician. Thankfully GigSalad had some answers and more thankfully through them I found Bumbling Bert. I am so glad we had Bert come to the party. He was amazing with all the kids! Very funny and outgoing. He kept the kids completely entertained and engaged!! The adults were enjoying the show too!! Bert even managed to keep a couple of our part-goers who wanted to "steal his show" in-check and was very professional and personable as he did it!! I have had a couple of parents ask for his info to see if he will be available for their upcoming parties!! Again, so glad we invited Bert to our party!! The kids are still talking about it and trying to master using their new wands!! Thanks to Bert for making my son's birthday party a super hit! Such a hoot and both the kids and adults loved the performance. So glad we had him come back for another party. Will definitely invite him again to our future parties as well! People if you looked up Bumbling Bert interested in his show as an option for your event whatever that may be involving children...look no further!! I am a parent of two 6&4 and we hired Bert to come put on his show for our son's 4th Birthday party, and truly~it was nothing short of amazing😌Bert has a special unique way of entertaining the children the magic part is the bonus!! And fabulous!! He knows how to make a connection so well with the children and his focus on them is so wonderful as an adult/parent, I was in shock, I was inspired, all at the same time as I was just as engaged as ALL the children!! This wonderful human being has a true gift, and I am soooo thankful that he's able to share it with others. He can take a room full of children and it's almost as if he's got them hypnotized into I promise the greatest experience that they'll ever have had up until then!! It's truly Magic what Bert knows how to do. Book him!! I promise you will not regret it. My heart was so filled with joy after watching him entertain all the children. We had a range of ages from 3 to 6 to 9 to 20, to 35, to 65 year olds and he made such a wonderful impression on every one of them!! Do it!! Book Bert~he's AMAZING!!! We have had Bumbling Bert entertain the kids at Scooby Soccer for 2 years now and have always been thoroughly entertained. He gets the kids excited and they are all engaged. The humour is at a level for the kids but he always throws in comments that entertains the adults as well. I would highly recommend Bert for birthday parties or any special event. We will have him back again next year for sure!!! Bert entertained at my daughters 6 year old birthday party last weekend. The kids loved every minute of the magic show, balloon animals and especially the glow in the dark dance party! My daughter was so happy, and so was I given that Bert entertained the kids completely for 90min! Thank you for an amazing bubble dance party! It was wonderful to see all the children dancing and smiling. Thank you for keeping everyone entertained!! Great music too! The children loved the bubbles. Awesome set! Humourous, magic and engaging! Our group of Preschoolers LOVED Bert! He was funny, engaging, patient and of course, Magic! The kids didn't stop laughing. Great show! Great Choice and Highly Recommended! Robert was a pleasure to work with since day one. It was very easy to book the event and communication was excellent. He performed at my son's one year old birthday party and the kids had a blast. He was very funny, outgoing and had everyone so amused, including myself. Even though my one year old could not participate, he made the effort to have my older son and other kids to help out. We especially loved the bunny in the hand trick! I don't usually write reviews, but just wanted to let Robert and everyone know how much we enjoyed his service! Thanks so much for coming today. The show is amazing and girls love it. When I asked what's the best part of the party, I got tons of "magician show". Also my daughter felt like a superstar and so excited that she can be part of the show. 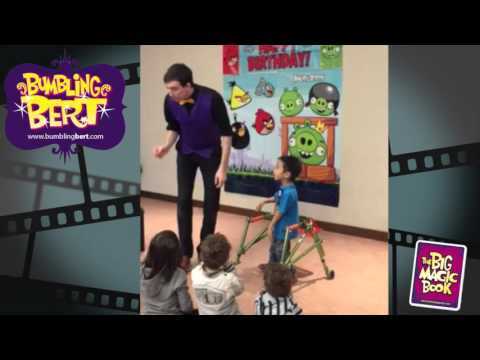 We had Bubling bert perform a magic show, have a dance party and do Balloons for the kids at my Son's 1st Birthday Party and he was absolutely amazing! The kids and adults all had a blast! Thanks for a great time!! We booked Bert for our daughters 8th birthday party. He was funny and had the kids totally captivated. The Magic show, dance party and balloon animals were a hit. Thanks so much! Bumbling Bert was AMAZING!!! He had everyone, ranging from 2 year olds, to skeptical 8 year olds, to adults engaged, laughing and amazed by his magic the entire time he was there. Robert was professional from the minute I first contacted him, as soon as he walked in the door, he started his performance so I was able to get party stuff done and actually sit and enjoy the show! He made our party a hit, kids and parents are still talking about it. I cannot recommend him highly enough!!! Bumbling Bert kept our 5-8 year olds laughing today. My 5-year-old birthday boy especially loooved it. Highly recommend for a fun bday party. The balloon animals were a great addition too! AND the kids loved the loot bags. Thanks! Once again, a GREAT time had by all! Second year we have invited Bumbling Bert to our school and once again he was great! Kept the children and staff laughing the whole time. The children couldn't stop talking about the amazing tricks and the silly antics like the "diaper"! To top it off the children danced away with fun and appropriate songs and dances. Hired Bumbling Bert for my sons 6th Birthday party. There were 25 kids and Bert showed up jumped right in front of the kids and kept them entertained the whole time. Very impressed with his professionalism. He didn't need hand holding and you could tell this wasnt his first time putting on a show. Impeccable customer service. Prompt. Brilliantly in entertainment mode from arrival to departure delighting a dozen 5 year old boys and parents alike. Tricky, funny, and appropriate. Seriously no need to shop around for another children's magician. We've had some very good ones over the years; Bert has topped them. Also, lootbags put together with thought and well worth it. Very entertaining, patient, tolerant. All round amazing show would definitely recommend him. I hired this company to entertain a few kids in my home for 90 minutes who are 11-12 years of age. The "danceathon" started first, followed by magic tricks, then balloon making. They loved it! Highly recommend Bumbling Bert for your next function. LOVED this act! The kids had a blast and the parents did too. Engaging, fun, happy, witty...it was wonderful and I would highly recommend Bumbling Bert to any parent looking to put a smile on the faces of their little children and guests. Great time! Bumbling Bert came to my son's 5th birthday party. The children (25 in total) and parents all had an amazing time. Very entertaining, keeping the children's attention for the entire show. Was on time and very professional. Highly recommended. Bumbling Bert came to help us celebrate our 5 year old daughter's birthday. We had her whole kindergarten class there and they were laughing, giggling, or dancing from the word go! Bumbling Bert was funny and fabulous for both kids and adults. Awesome interaction and knows how to read his audience. Most importantly, my 5 year old is super happy, and loved Bert. We will do this again! Kids and adults had a fantastic time! I would surely book Bert again, he was great with our high energy crowd. Also very helpful through the booking process. Thanks for a birthday to remember Bert!! Bumbling Bert took the kids attention 2 mins before he starts which is pretty amazing. His sense of humour with kids was totally bought. Everybody had a good laugh and enjoyed his show. His lighted sticks brought more colour in the room. Thank you so much for an amazing, wonderful, unforgettable experience. I am not bias but having Bumbling Bert on my daughters 7th Birthday Party is the best party I have been to. Bert was the perfect entertainer for a party of discerning 6 year olds. Self deprecating and energetic! All of the kids were engaged throughout the show! The parents were able to eat and socialize. Bumbling Bert was very professional, enthusiastic and energetic! Everything was seamless from booking onwards. Kids and adults all were entertained. Thanks for a great show! Bert was very entertaining for my daughter's 4th birthday in front of 25 of her pre-school classmates. They all had a great time and my daughter is still ecstatic days later. I have seen Bumbling Bert in action a few times now, from Canada Day at Albion Hills, and now in my own backyard. I loved the way he walked into my backyard and said hello to all the kids sitting there, almost like he was just another guest. They didn't even realize HE was the magician until he actually asked them if they wanted to do some magic. He had me in stitches from the moment he walked through the gate. I think the adults laughed louder than the kids....wait, NO! The kids had a blast. He had them engaged the whole time. I would, without a doubt, refer Bumbling Bert to any parent looking for a magician at their child's party! Bumbling Bert was prompt, and kept the kids on their toes, laughing their heads off from start to finish. He certainly made my daughters birthday! We hired Bumbling Bert for my son's 5th birthday party. From the time that Bert walked into our home to the time he stepped out, the kids were entertained! The kids loved him! The parents who stayed were all asking for his contact information because he was so funny and great with the kids. The parents who did not attend sent me emails thanking us for all the fun their child had with the magician. Apparently, all the kids who attended kept talking about Bumbling Bert for days after the party. Honestly, Bumbling Bert is a must have if you need to entertain a bunch of kids! He is not only a magician but also a great entertainer. He adapted to our very small house and made it absolutely comfortable for everyone. I booked Bumbling Bert for my daughter's 5th birthday party and so glad I did. I had 20 children ranging from ages 2-9 yrs old and they were all enthralled. It was very funny, interactive and the kids loved every second of it. At no point did it lag or feel forced. The balloon animals were also a nice touch. I had several parents comment how wonderful he was and that they'd consider booking Bumblin' Bert in the future. My Daughter had her 5th Birthday Party at the house. Bumbling Bert arrived at the party and was Instantly engaging with the children.. Had the Children and Adults all laughing and Entertained the entire time. He was professional the entire time and we would recommended him for any occasion. I am so glad we booked Bert for my son's first birthday party! I figured the entertainment would be mostly for the younger kids, but was pleasantly surprised that even my son was entertained! Great show for both kids and adults! Bert came to my son's birthday party today and did an absolutely amazing job of entertaining 10 children (the adults had a great time too). I highly recommend him. Thank you SO much Scott for being a part of our school Family Fun Night for the past 4 years. The students absolutely love your show and look forward to seeing you every year. Bert is entertaining and able to handle rambunctious 7 year olds! We first saw Bumbling Bert at RBG in Burlington and my son immediately asked to have him at his birthday party. Bumbling Bert is awesome, has an amazing way with those cheeky party goers and keeps everyone Entertained. Thanks so much! Great magic show. The kids and parents had a blast and we received a lot of complements on finding such a good magician. I would definitely recommend Bumbling Bert to anyone looking to add a something special to their party or event. What an absolutely amazing show, the kids were amazed not to mention the adults. Funny and witty, Bumbling Bert is truly an superstar entertainer. I invited bumbling Bert for the second time since it was a big hit the first time I called them.This company is very professional and never seem to disappoint you.Always go beyond your expectations with their diversity of performances.Kids get really involved with the magician and love their tricks.I love this company because they are very punctual and keeps the kids entertained. Bert performed at our daughter's 6th birthday party. He was able to keep the rapt attention of over a dozen kids, which is no small feat. Everyone, adults included, truly enjoyed the show, and went home with magic tricks to do on their own. Bumbling Bert entertained a rambunctious group of 4-6 year olds for an hour! He had them amazed at his tricks and laughing at his jokes. The kids and adults were equally pleased with the show. We would definitely recommend Bumbling Bert!!! Found Bert online, and what a stroke of luck that was. Kid party ages 2-10, and they were literally laughing like crazy the whole show - completely entranced. Half magic half comedy, 100% showmanship. Parents were in my ear ("this guy is amazing") the whole show. Lot of fun and great memories!! thank you Bumbling Bert for bringing all the joy and laughter to my daughter 's 7th birthday party. All the kids and parents enjoyed the magic show. Every parent ask me where did you find him? We really had a great time. Everyone loved bumbling bert. Especially kids. They had a wonderful time. There were continues giggles and smiles on everyone's faces. Kids were laughing and Bert was successful to keep them engaged. Definitely recommend him. I had around 17 kids at my home from age 4 to age 10. They are all amused by Robert. It was simply amazing having Bert for my son's 3 year old birthday party, he really knows how to cater to such a small age group, and kept the enthusiasm going till the end. We've had Bert at many of our branches, and our community just loves his visits. He has a knack for interacting with kids and getting people excited. Most importantly, everyone has fun. That's all we can ask for. Thank you so much Bert! Bert put on a great show and the kids (and adults) laughed their heads off. We had a lot of fun and would definitely recommend to anyone. The kids had a wonderful time. I would highly recommend Bumbling Bert for any function. The adults enjoyed the show just as much. Thank you. Great entertainment for all ages! Thank you for performing at our Annual Scout Banquet. Even though, we had a small turnout of children, a great time was had by all, including the adults. You had great interaction with the children. Your show was amazing and very economical! It was the best thing at the party. All the kids enjoyed the show, balloons, and dance. Even parents loved it. Parents have been calling me and asking about you guys and praising you. Once again thank you very much for making my daughters birthday so special. Fabulous entertainment for 15 children, who were entranced for an hour. I would definitely hire Bumbling Bert again. It was amazing. We could not have been more thrilled with Bumbling Bert at our daughter's 3rd birthday party. He kept 15 2&3 year olds laughing and entertained for the entire show - he's obviously extremely experienced with reading the crowd and transitioned back and forth between magic, dance party and balloon animals when necessary to keep them engaged. All the kids and parents were talking about how great he was. Our daughter was quite apprehensive about him for some reason so we really appreciated the time he took to send her a personal video message introducing himself before the party. He also managed to get her actively participating in the show and totally loving it, which was hugely impressive given that she was crying when he walked in the door. The whole booking process was extremely professional and easy, and he was extrmely responsive communicating before the event. I can't recommend him enough and he will definitely be at future birthdays for our other children. Thanks so much Bumbling Bert! Bumbling Bert was amazing! From my first contact with him to the performance, he did amazing job! When i first emailed him, he called me back within 5 minutes and then emailed me with what we had discussed within the hour. He was able to provide me with a police record check. He was always enthusiastic when we spoke on the phone. He was very accomodating with everything, including the goodie bags (I was able to order 5 more bags the day before the party). On party day, he called to let us know he was 10 minutes late. There were children ranging from age 3 to 9. He performed for the kids from the moment he entered the party. The kids were always laughing throughout his performance and the parents of the guests were all very happy with his performance as well! He was great at managing the children in a fun but effective way when they were difficult using music and just being playful. He made ballon animals for the kids and helped them if the animals fell apart or anything. He showed them how to do the magic tricks in the goodie bags. I recently broke my ankle and he even made me feel better with his joking around! Honestly, the only thing was that it took a few days to get the copy of his police check, but that would be normal for most performers, just that it was not standing with the high standard he had set. Otherwise, I really cannot think of any way he could have done better! Thank you so much for making Lila's party so much fun! Scooter put on an awesome entertaining show. The kids absolutely loved him and the parents did too. We had comments from the venue staff that they it sounded like so much fun they wanted to join in and watch the show. Bumbling Burt kept the kids engaged the whole time. My son had the best time at his party and the parents only had positive things to say. I recommend bumbling Burt for any party. This is our third year using Robert and his son! They are both amazing and really know how to entertain! We will be using them for years to come! Bert provided a magic show and balloon twisting for my son's first birthday party. Kids from the ages of 6 months to 12 years attended, along with many adults. Bert managed to keep everyone entertained! Parents told me that Bert even managed to bring the most shy kids out of their shells. Thanks again for a great time and many wonderful memories! Booked Bumbling Bert last minute for my sons bday party and I'm super glad I did! Kids had a blast, laughing and giggling and so did the parents! Robert was awesome to have in our home and felt as if he was part of the family. Thanks for a great day! Thank you for the amazing performance at Jordan's birthday. Both children and adults were laughing throughout the show. I'm so glad I booked you! I highly recommend you! Thank you so much for a great party Robert. Kids had an amazing time, and my birthday boy felt so special. All kids were entertained from ages 2-9. I'm so pleased we booked Bumbling Burt for our daughters 8th Birthday Party. The kids had so much fun and were keen to get home and show off their new magic tricks. Robert, thanks so much for delivering another excellent movie night for our school. You arrived early and were set up and ready to go why ahead of schedule, which was perfect considering families started to arrive earlier than expected. We enjoyed the pre-movie show you played and your announcements (both before and after the movie) were informative and helpful. Your professionalism and overall delivery were exceptional. Can't wait to do this again next year! We had 20 kids in our home for my son's 7th birthday party. They loved Bumbling Bert. The kids were very loud and energetic and Bert was great at handling them. He was very entertaining. Even a few jokes for the adults in the room. He did balloon animals at the end for which the kids quickly lined up. I would definitely get Bert for another party. It wasn't an easy crowd to perform for but the level of professionalism and patience never wavered. Thank you for your time and wonderful performance. Would highly recommend for any children's party or assembly. Bumbling Bert had everyone laughing! Bumbling Bert was an incredible addition to my son's 5th birthday party. The kids were engaged for the entire magic show and the adults loved his jokes. Absolutely hilarious! My 7 year old and her friends were in awe (and giggles) throughout the show! Scott was wonderful; the magic was amazing and he kept the rowdy bunch entertained and engaged throughout. We would all highly recommend this for all ages! Thanks so much! Kids love a funny magician! A wonderful magician that the children absolutely love watching. The kids were so thrilled, even my shy and silent nephew was so excited...I have never seen him like that before! Fun, friendly and a fantastic magic show! We celebrated our son's 5th birthday with a group of 20 kids and over 25 adults, everybody loved Bumbling Bert's show. Scott was great at managing the group energy, making them laugh the whole time and keeping them interested with a nice balanced show that included neat magic tricks and kids appropiate funny jokes. Bert performed at my daughter's bday party. The ages of the kids ranged from 4-10. Bert kept the entire crowd entertained beautifully for the entire hour. The kids were excited and engaged. I would definitely hire him again. I hired Bumbling Bert to perform his amazing funtastic magic show for my son's 2nd birthday party. The party theme was Bubble Guppies so having the bubble dance session was a great touch for the little guppies. Bert was enthused and very kid friendly. The children attending the party age ranged from 2 to 10 and Bumbling Bert managed to capture the different age groups undivided attention. The show was a smart touch to the birthday celebration and I'm extremely please with the service I received. From the professionalism to the customer appreciation I received I would definitely refer and rebook with this company. Thanks so much for making Taylen's birthday a memorial one. Mastered the 7 year old audience! This week Bert came to entertain a group of 7 year old boys for my son's birthday. Right from the start he knew how to engage with them and kept them entertained, laughing and participating the entire time (which is not easy!). They are still talking about him in the school playground days later! Bert made the party awesome for everyone - thank you! Robert was really patient with the kids. He tried to keep his cool in a funny and professional way. Overall, I give 4/5 stars to Robert or I should say Mr. Bert. Your kids were wonderful, I'm glad they had a fun time! I'm sorry that we need to charge HST, its part of being a professional business. We all LOVED Bumbling Bert's Magic Show! The kids were hanging on his every word! Kids ranged in ages from 2 to 7 and they were all mesmerized by his antics, magic and energy!! We loved the show - Bert was amazing - he is a true master of his art. Kids were 100% involved, each child got his moment of spotlight, too. Bert is a real professional - for more than an hour he kept attention of 10 kids and he managed the situation every moment of it. And all the parents present at the party were enchanted, too. We already asked Bert to come to our next Birthday Party! Bert gets kids' attention and also, their respect! We recommend 100%! Thanks again for the great entertainment! The kids and adults truly enjoyed your show. You once again exceeded my expectations and I am very pleased! I look forward to having you at our next event!! A magic day at the First Annual Heart Lake Happenings BBQ!!! Thanks to Bumbling Bert, our magician, who got the day off to an hilarious start!!! If you want a laugh a minute, hire Bert for your next kids birthday party or corporate event!!! 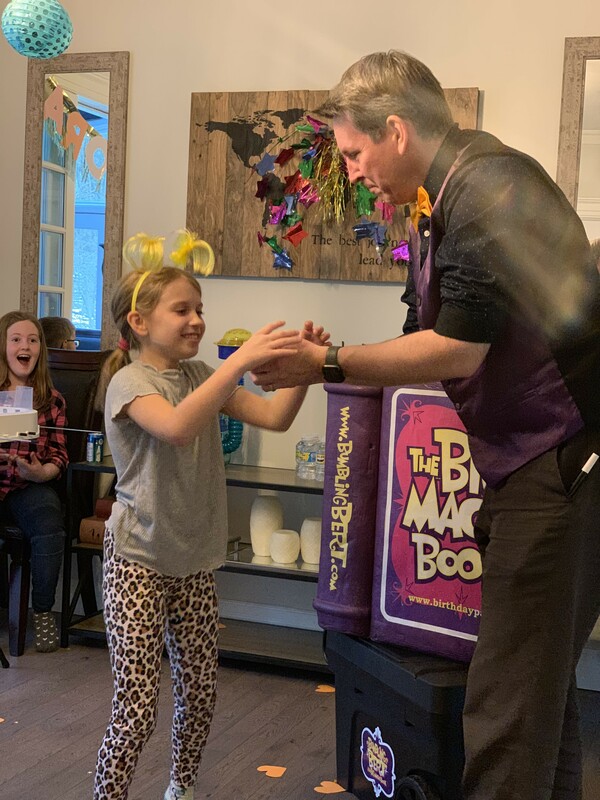 My daughter turned 6 this month and we booked Bumbling Bert for a magic show and dance party. I had never seen my daughter have so much fun at a party. She was smiling, laughing and dancing the whole time. All the children also had so much fun with Bert's humor, magic, disco lights and music. It was non stop laughing and fun for the children and parents. Thanks so much Bert. You were great fun for the kids! WE LOVED THE SHOW ALL OUR CHILDREN WERE ABLE TO PARTICIPATE. THE SHOW KEPT THE INTEREST THIS INCLUDING MY INFANTS AS WELL. THE CHILDREN ENJOYED BEING ABLE TO PARTICIPATE ALONG WIHT YOU. we recently used Bumbling Bert for our child care centre open house and were really pleased with his service. We had done our research and gotten several good recommendations before booking him and what we experienced was very consistent with what others said. He was prompt, well prepared and adapted to our event to help us make the most out of it. His manner and style of entertainment were great and the kids and families really enjoyed him. As a manager I found him very professional and appreciated that he offered suggestions and communicated with me through out the event. I would definitely recommend him for your event. this show was even better then anticipated! We had a group of over 30 children ranging from 18 months all the way to 10 years of age and absolutely everyone was entertained for the entire show, even the adults! Kids did not stop smiling or laughing throughout! Would for sure recommend this show to anyone having a party and will for sure be contacting them again for our next event! We were dancing and singing and shaking to the music. Unfortunately we were unable to have the bubble party as it was raining so instead, we got our groove on to the glow-in-the-dark dancing. Bumbling Bert came to my daughter's 6th Birthday this past weekend and the performance was simply amazing. My daughter along with all her friends (and parents) were very entertained. Cannot wait for my other daughter's birthday to have them be a part it again. Scott was just great. Very funny, magic was great, very patient with some of the kids who were not listening. Would recommend to anyone. Scott was AMAZING!! !From the magic show to the bubble dance party all the children from the toddler to school age group were engaged even the staff had a great time. It was definetly worth it and we can't wait to have him come back again. The magic show was very entertaining. The children loved it. The indoor bubble dance was very fun and even the toddlers had an amazing time. This was our second time having Bumbling Bert/Scooter Sparks out to one of our 5-year old twins parties, and the 5th time we've seen his show...And I think we love the show even more each time! We had about 20 kids and their parents in our backyard for a summer party, and it was an unforgettable afternoon. Everyone loved the magic show, and then we combined the dance party/balloon animals with some traditional summer kiddie races that I had planned, and that Bumbling Bert took to the next level. I wish every day could be like that - just perfect! I have had the pleasure of booking Bumbling Bert for our child care centre quite a few times now and they never disappoint! Every time there is something new that the children and teachers absolutely love. The young man is always funny, prepared and is fantastic with the children. I would recommend Bumbling Bert for any function and for any age. We always enjoy having you at our events!! Everything was great Robert and Thank you Paula for booking us in, you will be apart of our family fun day for years to come!! We hired Bumbling Bert for our school fun day. 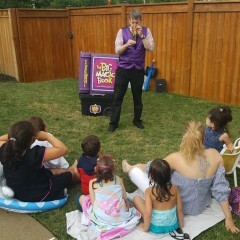 The kids loved his antics at the magic show and the great music he played for our outdoor dance party. Givins/Shaw Daycare loved Bumbling Bert's Magic show and Bubble Dance Party!! He was entertaining to both children and adults. The show was very interactive and surprisingly...even some of our shy children went up on stage with him! Some of the children's comments were " I loved dancing with bubbles", " He was surprising and silly", " I liked his trick with the big bunny and the small bunny"
We will definitely book Bumbling Bert again for a future special event. 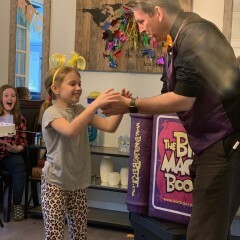 Our daughter had a fantastic birthday party thanks to the fantastic magic show. All the kids and the parents had a great time. The magician was able to capture the attention of all the people at the party, regardless of age. We would definitely recommend Bumbling Bert to anyone who is planning on having an exciting magic show at their kid's birthday party! Kids really enjoyed the show and had a great time. The presentation was amazing, children and staff really enjoyed the magic show and glow in the dark dance party after! My husband and I couldn't be happier with the magic show you put on for our two son's birthdays this past weekend. You not only had 15 kids engaged for 45 min, but all the adults engaged as well. Nothing beats belly laughter from a bunch of kids. It was also really nice that you included both birthday boys in your show, I know it made them feel extra special on their big day!! We will for sure keep you in mind for future events and look forward to seeing you again. All the best, and thanks again for an incredible show!! Thank you, Bumbling Bert! You were the perfect entertainment for my daughter's 5th birthday party. In fact, it made her party the easiest I've had to date. You provided the entertainment and all I had to do was watch. Awesome, thanks again. Bumbling bert was a great addition to my sons 5th birthday party, both children and adults enjoyed the show. I had many requests for his information after he finished his magic act. He also did balloon animals and the children absolutely loved them. If your looking for a magician for your party look no further then Bert he is great! He can really make your child's party magical. A Bass Dropping Good Time! He was awesome! Not only was he a Professor Jamz, but also a Bumbling Bert! He played every song we asked for! We could use the mic and sing along! My favourite part was when, during "Turn Down for What", before the bass drops, he yelled "Ma name's Jeff!" He showed us magic tricks, and gave us glow sticks and necklaces. It was AWESOME!!!!!!! We had a fantastic experience. Bumbling Bert was amazing and all the parents at the daycare facility raved about the fantastic party we had for our 4 yr old graduates. two years in a row of awesomeness! Bert was amazing. My son's birthday party was initially outdoors but due to rain we had to move everything indoors. Bert worked with the small space and had the children entertained the whole time. They were laughing and screaming until the very end. He dealt with the difficult children incredibly and he had everyone involved. My sullen14 year old daughter thought he was so funny and even asked if she could have him for her birthday, if Bert can entertain my daughter he can entertain anybody. Thank you for making my son's 6th birthday an event to remember. Bumbling Bert was a hit for our daughter's 8th birthday party! He had 12 little girls (and 5 adults) smiling and laughing from the moment he walked in. He entertained us with magic, bubble dance party and balloon animals. It was definitely the BEST birthday party ever!! We will be sure to have him back again for our younger daughter's birthday party! Can't wait!! If I had to rate this party out of 10 I would rate it 12/10. The party was amazing. Bumbling Bert really gets the kids attention and keeps the kids attention. we chose a 90 minute party and that was money well worth spending. The magic show was a huge hit and the dance party, wow! It was like being in a night club and the balloon animals were excellent. We will definitely have Bumbling Bert back and recommend him to other friends. Great Job!!!! Bumbling Bert is INCREDIBLE!! How he managed to keep 15 screaming 5 and 6 year olds engaged for longer than 3 minutes is beyond me but he exceeded our expectations. The kids (and adults) loved his sense of humor and his magic tricks were amazing!!! One of the kids at my sons party said this was "the best birthday party she had ever been too". I would HIGHLY recommend Bumbling Bert for ANY age party!!! For my kids 5&6 birthday party we had a great time the bubble dance party was awesome and the magic show had ne in tears from laughing so hard. Great for the kids and adults. I will most definitely be using them again!!!! We just finished celebrating my son's 6th birthday and everyone at the party LOVED it! Bumbling Bert was able to engage the kids attention from beginning to end with endless laughter. All parents were equally as entertained. Thank you! Thank you very much for performing at our Unionville Public School Fun Fair. The students really enjoyed the humourous, interactive show. Scott entertained staff, students and parents at our Annual Fun Fair with great music and magic. The bubble machine added to the experience. Thank you for bringing such a positive, fun energy to the event! Thanks to Robert for doing the show at home in the last minute. We had 10 nine year olds to engage for a birthday party and Bert made it easy. It was a surprise gift of our son and all the kids were running uncontrollably in the house; and from the moment Bert walked in, he had them pinned for the show for 1 hr and my son and all kids and of course we enjoyed the show so much. He is really good in being funny and keeping them focused . Most importantly he was very age appropriate. Totally recommend him. Thanks Bert!! Just had Bumbling Bert come to my kids' 5th & 8th birthday party & the kids & adults loved it. Very fun, silly humour! Loot bags were excellent too! Bert was very entertaining with 20plus 5-6 year olds with lots of energy. He was able to entertain kids and adults alike. We had the Magic Comedy Show for a PA day. All the kids from 3-11 along with the teachers were laughing and enjoying themselves throughout the whole show. A fabulous time for all age groups. We will definitely have him back!!! Thank you so much for an outstanding show! Both the kids and adults thoroughly enjoyed themselves and look forward to seeing your show again in the near future. Thanks for helping to make our party such a success!! We had Scott as our magician for our 5 year old son's birthday party. He arrived on time, he was professional, and he was really funny. The children and the adults all enjoyed his performance. Scott, thanks for making Henry's party one that he'll talk about fondly, for many years to come! This show was less about magic than about drawing kids into fun engagement with a performer. The tricks were few and simple, but the patter and interactions had the kids squealing with delight at a grownup who knew exactly what they'd find funny. I was really impressed by how Bert dealt with a bossy three-year-old who kept running up to push and whack him from behind (he pretended not to notice at all), and with his very subtle but effective approaches to making sure none of the older kids monopolized the show at the expense of others. His specialty magic loot bags were a major hit with the kids, and his routine of showing them how each take-home trick works held them spellbound. The balloon sculptures were the crowning achievement: he put on an uncannily accurate selection of kids' favourite dance tunes and got the whole room dancing while he crafted animals, flowers, swords, and anything else requested with incredible speed (even behind his back). At the end, a parent of one of our guests made sure to get his card. Our birthday boy (turning 6) was all smiles throughout, and afterwards said he'd really enjoyed it. My daughter went to a birthday party about 2 months ago and saw Scooter Sparks, she then desperately wanted him at hers. After we got rained in and had to have an indoor party Scooter Sparks did an AMAZING jobs keeping 18 "high energy" 5 yr olds entertained!! Even the parents loved the show!! Couldn't recommend him more!! Fantastic interaction with the kids!! Bumbling Bert was the best entertainer I could have booked for my son's 5th birthday. It was a mixed group of kids of ages 1-5 and all the kids were laughing and participating from the very minute he walked in the room. He knows how to relate to kids and is truly gifted in his craft. Scott from Bumbling Bert had my daughters and all of their friends dying of laughter throughout the whole show. They were also totally mesmerized by his magic tricks. Thank you for making their birthday party so much fun for everyone (including the parents). We had Bert come for our son's 4th birthday. There was a group of 20 or so kids ranging from 2-6 years of age. Bert was awesome. He kept them entertained and engaged for the whole time that he was there. My son could not stop laughing and giggling. Even the adults had a blast. Thanks for an amazing job Bert! My daughter enjoyed her birthday party with Bumbling Bert. There were 16 girls and he knew exactly how to keep them interested and also laughing. He had us adults laughing as well. She loved the balloon animals and the bubble dance party. Great time!!! I saw "Scooter Sparks" at one party and immediately had to book them for my son's party. Truly awesome show and just great interaction with kids. By far the best kids show magician I've ever seen. Would do it again for my daughter. Bumbling Bert!? More like Baffling Bert!!! We recently had Bumbling Bert out to help celebrate our daughter's 5th Birthday Party!! We had 23 children and we definitely needed someone to entertain the crowd....and WOW Bumbling Bert did not disappoint! From the minute he entered the room (he wasn't even set up yet) he engaged with the children and he didn't stop engaging them until the door closed behind him as he left!! The dance party was a huge success, and the magic show amazed the children as well as the adults!! Each and every guest was entertained the entire time of the show!! My little one had a big smile at bedtime and said "Mom that was the best party ever....like it was totally awesome!" Thanks Bumbling Bert for making it TOTALLY AWESOME! Also, big thanks for all of the communication prior to the party, answering my questions and speedy to return my calls/emails. THANKS FOR EVERYTHING! The magic show and glow in the dark dance party were such a hit!!! The kids and adults loved it! Bert's son came out to do our show and he was so accommodating! We asked if he could lead everyone in the birthday song between the magic show and dance party, and it was awesome! The transition from one to the next was smooth and fun. The kids had a blast!!! Thank you so much!!! This made our party the hit it was! Thanks!!!! Btw... Bert and his wife Paila and son are all amazing to deal with... Communication was clear, responsive and so accommodating! All the kids enjoyed the party tremendously. My daughter Sanaea, spoke about how much fun she had with the magician on the ride home. Thanks for making my daughter's party memorable. GREAT with kids and knows what appeals to them. I hired Bumbling Bert for my twins' 7th birthday party and the show was a 'knocked it out of the ballpark' HIT! The kids laughed from beginning to end (and so did the grown ups!). He geared the show to the age range at our party (4 - 8) and it was completely age appropriate. To be honest, my fear in hiring someone I hadn't actually seen live before is that the show might be too 'babyish' for my 7 year olds and the kids would think it's 'lame'. As it turns out I had nothing to fear! He is GREAT with kids, talks to them on their level and really knows what appeals to them. 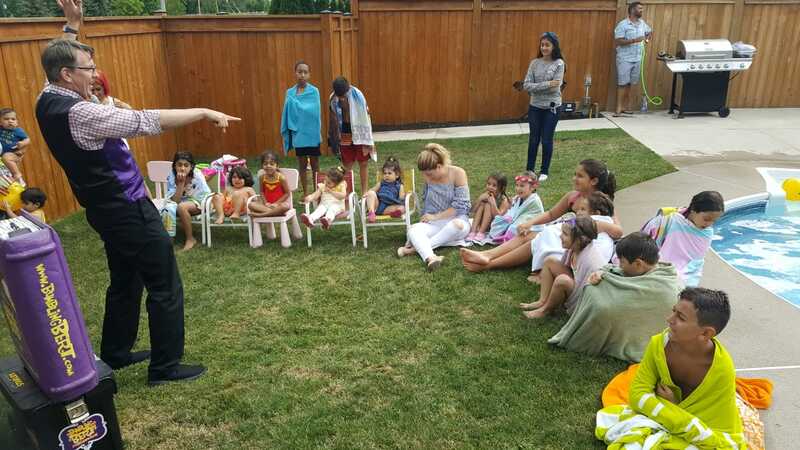 All the kids who attended the party have told their parents that the best part of the party was that magician guy!! And on another note, I've worked in the event industry for 25 years and I was impressed with the professionalism of Presswood Entertainment. They provided all the information I requested in a timely manner, followed up with me prior to the event to confirm deliverables, confirmed the arrival time on the day of and then delivered a fantastic show as promised. 10 out of 10 on all fronts! Entertainer of the year award goes to Bumbling Bert! A BIIIIIIG thank you to Bumbling Bert for being our entertainer for Grace's 2nd birthday party! You were speedy fast to set up and clean up; with no assistance at all! You were super fun and funny with the kiddies and adults alike. The magic show was awesome!! Even though the venue didn't accommodate for the glow-in-dark dance party...it was still a party like no other. The bubbles were poppin', the music was bumpin', the rings were flashin' and the children were burning all their energy(you're welcome parents!) hahaha And you still found time to make all the children a balloon animals! Thank you so very much for a great day. All the kiddies had a wonderful time, the birthday girl had the best day of her life and the parents all had great reviews. You were well organized and it took a lot of pressure off of me :) I will definitely be booking with you again. Scott was great with the kids, and the adults enjoyed the magic show too. Thank you Scooter Sparks for a great performance! Thank you for making Marc's 7th birthday celebration complete. My son and all his little friends had a blast. They all enjoyed both magic show and the dance party, you even got the attention of the adults. We all had a great time and enjoyed the show! It was our daughter's (Yuvi) 3rd birthday, and we wanted to do something special for her. We have been to many kids B'day parties where they have invited magicians, clowns, people dressed up like cartoon characters etc, and one thing we time and again noticed was, "The kids are not really enjoying the show and having fun". The attraction wasn't there, and in some cases it was even worse, which was depressing to see. Thanks to my Wife, she did a extensive search on the internet and found "The Best Berts- Bumbling Bert"
Like I was mentioning above,there are many options out there, the cost effective ones, the more items for less money, etc. But in the end it all comes down to 1 question, what do you want for your kid? Do you really want your kid to have fun on his/her special day? If Yes??? Then just go for the Best - "Bumbling Bert"
Thank you for amazing DJ party for my son. The kids had a blast!! Bert came to our son's 6th birthday party at our house. He had 16 rambunctious 4-6 year olds watching his show. He was fun and funny and could totally take control of overly active children. He had the parents talking after the show as well. He is a kind man and has a genuine love for what he does. I will highly recommend him and use him again! my daughter loved her 7th birtbday party and enjoyed every moment of it. Especially being the magician assistant. Kids had a blast they were laughing out loud. Bumbling Bert was interacting with them perfectly. They also danced on their favorite songs in a glow in the dark theme. It was much better than what I expected. The scene: a two-year old birthday party at home for roughly 50 kids and adults. Show was a good balance of kid and adult humour and interaction with the young audience. Full audience engagement from beginning to end. My son and his friends and family enjoyed the entertainment. The glow in the dark dance party was awesome! Scott put on a fantastic show for a group of 8 to 9 year old girls and a few smaller kids too! He kept them all entertained and guessing the entire time. There was never a dull moment and at the end he went through how to perform all the loot bag tricks. Everyone was having fun even the adults! He even kept the attention of kids as young as 3. All I want to say is that Bumbling Bert put life into my son's birthday party. The kids had so much fun that each and every parent inquired about him. He was extremely professional, very understanding and adjusted his schedule according to my requests which was very helpful. He connected so well with the kids and from the moment he stepped into the room they couldn't stop laughing. I have never written a review before in my life but I had to write one for him as it is so truly deserved. We had Bumbling Bert for our twins (boy and girl) 6th Birthday party. The kids had a wonderful time watching and participating in the magic show. The disco dance party was a huge hit. Watching the smiles on the kids faces was priceless. For the adults, they had a great time as well and were laughing throughout the entire show. One of the kids that came to the party said this was the best birthday party he’s been too. For us (the parents hosting around 15 kids) it was a nice chance to sit back and enjoy the show as well. We hired Bumbling Bert for our daughters' 5th and 7th birthday party. It was a mixed crowd with kids and adults of all ages. Everybody enjoyed the joy. He was high energy and able to control a crowd of 30+ rambunctious kids with humour. Lots of jokes for kids, just enough jokes for the adults. Was enjoyed by all. We went a bit overboard with my twin's 5th birthday party, with nearly 40 little ones to entertain. But Scooter Sparks/Bumbling Bert had their full attention, and the kids and adults alike enjoyed every minute of it. Everyone left here saying great things about the show, and I think there are probably a lot of 4 and 5 year olds doing magic tricks for their parents tonight! We did the dance party and balloon animal package, and I was amazed by the sheer volume and artistry of balloon animals he was able to produce in that 45 minutes. Just a great experience from beginning to end - highly recommend! It was our third time having the pleasure of seeing his show, and I hope it won't be the last. Bumbling Bert hosted our son's and his friends for his 5th birthday or should I say friends and parents! From the moment BB walked in he was in command of his audience! There were 28 children AND 29 adults. Everybody was delighted and had a great time. There was never a dull moment or lull in the 90 minutes that he was there. My son felt so special as did all the children. He included all of them in his show. I would highly recommend him for your event(s). A few of the parents even commented "I want him at MY birthday party"! Well done Bert!!!! 100% value ... 100%!!!!! Bumbling Bert was a magical hit at my son's 8th birthday party!!! A huge thumbs up. A room with 32 kids mostly 8 years old and ranging from 3 to 10, Bert kept all the kids engaged, excited and enthralled with magical 90 minute experience. All the adults even enjoyed the party. The magical workshop gave the kids hand-on play and fun games. My son and his friends said it was the BEST party ever! Bert has a magical connection with children. Very highly recommended! I have thrown a birthday party for each of my kids for the past 7 years... and this was by far the best thanks to Scott! I have had so many parents ask for his information and email me thanking me for a great afternoon. Not only have I never seen so many children and parents engaged in the performance, but I am so grateful to Scott for accommodating the special needs of the group, which included children with physical disabilities and autism. I would not hesitate to recommend Scott to anyone!!! Very happy with the show. Made my daughter very happy. She just loved being the magicians little helper. All the kids and adults enjoyed the show. Thank you Bert for your fantastic performance and for making our son's birthday truly memorable. Kids thoroughly enjoyed Bert's humor and the magic tricks he performed. Lots of ohs and ahs! Loot bags were a hit too. I would highly recommend Bert to anyone looking for a quality entertainer. Bumbling Bert was simply fantastic! 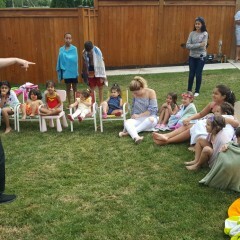 We had 16 kids in total for my son's 6th birthday party and he had their undivided attention for the entire hour! There were ohs and ahs from the various magic tricks he performed + the uncontrollable laughter not only from the kids but the adults watching as well. I thought it was great that he interacted with each kid at the end of show by making balloons (sometimes two balloons). I was looking around for some sort of entertainment for my son's 7th birthday and came across Bumbling Bert.He was amazing. The kids and adults had a fantastic time and the disco party at the end was so much fun. I would highly recommend him to anyone and can't wait to have another event booked with him in the future. Thanks a million! Bumbling Bert was incredibly professional leading up to and on the day of the magic show. Children and adults alike were thoroughly entertained by his sense of humour and magic tricks. He did a fantastic job at including the audience in the show. We had Bert attend our daughter's first birthday and all the kids loved the show! I will be recommending to all my family and friends. Best party ever! Hands down! What a blast!!!! This past Sunday (Dec 21, 2014), Bert did a bubble dance party for my son's first birthday. There were just under 30 kids, most in the 1-9 age range. They all loved him, and so did all the parents. He really understands how to engage and entertain children, while still keeping the fun family appropriate. He even came prepared with his balloon art supplies in case they were needed (took this initiative beyond our original arrangement) and got them going when the mood struck. Guests kept asking me how I found him, and even the staff at the venue couldn't take their eyes off the partying. My husband and I have already started talking about what we can book him for next. You will be thrilled if you just with Bert. Thanks, Bert, for making my boy's first birthday incredible. Each child was spoken to directly and he managed to have them laughing and focused on his tricks. They were happy that he came to the party. Kids laughed and had fun. Very entertaining and professional. First dance party for us but certainly not the last! Thanks Scott for being our DJ at the Glow in the Dark dance. The children, parents and staff had a great time. The next day a bunch of children asked me if you could come back every day. While a couple of the younger children were initially scared they soon joined in the dancing. The music selection was great and you have some pretty good moves! Children's Christmas Party a hit! We had Bumbling Bert at our party in December and he was fantastic! All the kids enjoyed his performance as well as the parents. He brings a lot of energy and gets the kids involved in what he is doing. One of the better magicians I have seen for sure. We would definitely book again. Bumbling Bert kept the children engaged for the entire show. Parents expressed their satisfaction as well as staff. We would be happy to have him back again in the future. The kids and my daughter (the birthday girl) looooved the show! They didn't want Bert to leave! To quote the friends "best party ever!" Thank you thank you thank you for making our son's 3rd birthday party a huge success! Children all ages AND parents laughed the whole hour. Bert's show is worth every penny! Once agian Bumbling Bert has made the children at NIlfisk Advance Canada have the best Christmas Party. The children left talking and laughing about the magician and the parents still rave about him. Everyone spoke about your show long after you left. Thank you for making our first experience hiring a magician perfect!! A magician that leaves an impression! The experience you offered was amazing for all of us, not just for the kids. Thank you for being such a great entertainer and filling the whole hour with magic and excitement. You did not rush through it and your enthusiasm was what we had hoped for! We will definitely keep you in mind for other events, as I'm sure others there that saw you will too! Bumbling Bert knows his audience! My son's 5th birthday party was a success thanks to Bert. It was the first year we went all out and invited over 20 kids. The pressure of party planning was off as I knew I had entertainment covered because Bert was highly recommended by a close friend. The kids had a blast and the look on my son's face made it worth every penny! We had Bumbling Bert in our home for my son's 6th birthday party . The kids loved the magic show and the dance party was fantastic! Lights, lasers and lots of laughs. They arrived on time and stay professional and calm even when the children audiences started getting too excited during "learn to twist" session. Bumbling Bert did a good job on getting attention of the children and most of the adult. His speech is clear and loud. Our party enjoyed his performance, he is nice and polite. A couple of families did asked for their name card for future contact. I did the review for you. However, I am not sure my review is good or not as I don't have a lot of experiences watching magic shows, so I can't really compare. Hopefully, the review helps! I wanted to have my son's 5th birthday party at home rather than in a play area but I was worried about finding good entertainment (didn't want my house destroyed by 17 5yr boys jumping from the couches thinking they are all Spiderman). Bumbling Bert was highly recommended by a friend and so I called him to find out about his show. He's been working as a magician for years and has truly mastered magic. He also has excellent people skills. He read my crowd of Spiderman-wanna-be's really well and put on a excellent show that kept the kids (and parents) entertained. I would without a doubt recommend Bumbling Bert for 5-105 year olds. Bumbling Bert's wife Paula sent me a booking confirmation right after I booked and was very punctual with all of my questions. Thanks Paula and Bumbling Bert for making my son's 5th birthday magical! We had chosen Bumbling Bert for our son's First Birthday Party. There were over 80 guests both young and old. He provided magic, music and balloons. Adults and children alike were laughing and smiling at the entertainment provided. He was professional, personal and a genuine pleasure to have for our family event. We highly recommend him and look forward to future events with him. Thank you so much Bumbling Bert for making his first birthday extra special!!! We recently had Bumbling Bert for our daughters 10th birthday party. We were completely satisfied with the hour we paid for. Everything went smoothly and he had all of the kids attention from the second he walked in the door until he left. He was great with the kids and had them laughing and excited the whole time. Us two adults even enjoyed the whole show. My daughter had the best birthday ever and we would absolutely recommend his services to anyone planning a children's party. What a wonderful job! Scooter Sparks did an incredible job at my 5 year old twins birthday party! They loved it, he was engaging, fun and kept the kids giggling. One friend was crying he was laughing so hard. The next day my kids can talk about nothing but how much fun he was! Highly recommend him! We absolutely loved the show! Entertaining and engaging everybody was laughing and had a very good time. Parents were asking how I found you! We will for sure book again!!! Thank you for the wonderful show you put on! The children still talk about it as a highlight to the night (actually even some adults do too). The magic tricks were captivating & mesmerizing. Although we had a small group, it made it more personal as they all felt part of the show. Fantastic fun for all ages! We hired Bumbling Bert for our son's Baptism after seeing him at another event. Bumbling Bert was very personable and engaged the children as soon as he started and the kids took to him immediately. All the children enjoyed the whole magic show and dance party immensely. My two older daughters couldn't stop laughing and dancing for the entire time. Bumbling Bert is also very accommodating and will meet any of your requests if possible. We only hired him for two hours but realised that this wasn't enough, and he was able to arrange to stay an additional hour which made our little guests very happy. We are still getting compliments a week later not only from children but from the adults at our event as well! I would highly recommend hiring Bert for any event...in fact he is coming to my son's first birthday in a couple of weeks as well. We found Bert through gigsalad and after a lot of research and reading several reviews we decided to book him for our daughter's 2nd birthday. I was worried about the birthday girl, who isn't always receptive to new faces but she had a blast which was nice to see! All the kids had a great time and our little princess even received a tiara which was a nice touch! We hired Scooter Sparks from Presswood Entertainment for our daughter's 1st birthday party and we all enjoyed the show. We are still talking about the show and about how much the kids were giggling and having fun. The dance party was also a hit for the kids. Thanks you so much for making this day extra special. He was hilarious . My son keeps asking when he will be back. Or why can't have have him everyday. Our first experience with Presswood Entertainment was when we saw the music show during the Captain R. Wilson festival. We hired Scott for our sons’ birthday party at our place. Scott handled 25 children very well. All of the kids greatly enjoyed the show! We highly recommend Scott!!! He is very sweet, very professional and knows what is he doing. The music, the beautiful balloons and the magic show at the end! What else we can ask? I wanted to thank you for yesterday's show! You were truly amazing and the adults enjoyed the show just as much as the young ones!! Thanks again and keep doing what you're doing because you rock!!! Robert was an incredible performer and the children absolutely loved him. Although children can be rowdy at times, Bert new exactly what to say to keep them focused and entertained. He is extremely professional, witty and AMAZING at magic! The adults couldn't help but watch the show in amazement with the children. Well done! Bert's magic show is absolutely dazzling! My experience with Bumbling Bert and the Big Magic Book was exceptional. I spontaneously booked the Bert for my brother's birthday party (2 days before!) and his assistant, Paula, communicated with me in a timely, efficient manner. Bert arrived 15 minutes early, politely introduced himself, and proceeded to occupy the children for almost 2 hours with no requests for assistance from the hostess of the party. He utilized the small space he was given to perform, made the children laugh hysterically and truly believe that he was capable of magic. He made my brother's birthday an amazing success and I am so thankful that I took a chance on him. I was skeptical about booking someone online without any referral from someone I trust, but it was definitely worth the risk. I hope this review brings Bert great business!! We ran out of options for entertainment for our Son's 7th birthday. I am glad we did because we would never have had the pleasure of enjoying Bumbling Bert's show! Bert was fantastic and the kids of all ages - including adults - enjoyed the magic tricks and the jokes! My 7 year old is somewhat shy, but he had no problem assisting Bert with his show. Bert was on time and it was so easy to book the date and time. He even followed up a few days before for confirmation which put us at ease. I highly recommend Bumbling Bert's Magic Show. You will not be disappointed! Our first experience with Presswood Entertainment was when we saw the magic show during the maple sugar festival. We hired Bumbling Bert's son for our sons 4th birthday party at his montessori school. All of the kids greatly enjoyed the show, as was evident by their smiling faces, laughter and increasing volume level as the show progressed! The teachers and other adults present all wanted Presswood Entertainments business information for future bookings - in all their years of education, they said it was the best entertainment show they have ever seen. We agree! The magic show provided by Bumbling Bert was excellent and was the perfect act for our daughter's First Communion. He engaged children and adults during his presentation and surprised them with every trick he performed. Everyone is still talking about the show and I will make sure to have him in my list for the next family event. Thanks you so much for making this day extra special. You have made a 6 year old very happy! We can't thank you enough for the fantastic magic show that you put on for a room full of very giddy and excited 5 and 6 year olds! Watching the smiles on their little faces said it all!! Your show was entertaining and hilarious...we will definitely be using your services again! Thank you for making Alex's party a huge success! We accidentally stumbled onto Bumbling Bert's site, and are we glad we did. I can not say enough wonderful things about this man and his entertaining performance. I plan to hire him again and again. His rates are very reasonable in comparison to the value of his talent and after his engaging performance which was an incredible magic show, his endearing comedic personality and his awesome balloon characters my children and their friends were delighted and in awe of this wonderful man. Our venue was an ice cream shop and the service was not pleasant at all times, but Bert saved the day and made their birthday party the memorable special event that it should be. In my son's 5th birthday party, Scott came in with full load of fun, jokes and amazing magic performances. My son loves magic tricks but he's a little shy. Scott managed to get him involved in the bunny tricks and my son had a fun experience. It was a blast. Everyone in the party, including seniors, adults and kids enjoyed the show. The kids went on and on about the tricks and jokes even afterwards. Thank you, Scott! We invited Bert on my kids' birthday party . All of the kids & adults had really great time. Bert, thank you for making our party more enjoyable and unforgettable for all of us! You are very lively and I believe that my kids won't forget you as alongwith fun they had a great learning time as well. Thank you once again from all of us for joining us and making our special moments more special. Bumbling Bert was amazing! He had the kids (and adults) engaged the whole hour and was a lot if fun! Bumbling Bert did an amazing job at my son's 1st birthday party! The children aged 1-12 and the adults were all very entertained. The balloon animals were a hit. I was extremely pleased with the entire experience and would happily recommend him to family and friends. Bert was an amazing addition to our party. Not sure who enjoyed the show more, the parents or kids. Thanks Bert! Bumbling Bert was at my 9 year old granddaughters birthday party this past weekend and was enjoyed by all ages. There were only 4 children in attendance but we all felt like kids and had a great time. We all enjoyed learning some magic and being mystified. Bumbling Bert took no time to set up and clean up. Was able to get the kids attention right away to begin the show. He did some fun tricks, acted silly, the kids were laughing quite a bit! My birthday boy really enjoyed being the assistant and getting to participate in the show. One joke went over their heads because it required reading because they dont know how at 5 years of age. He knew when to switch activities to get thier attention back. The lights for the dance party were great and he had some fun music for the kids to dance to! It got some parents moving too! The ballon animals looked really good and he gladly made replacements if the kids popped one! I am not sure if he intoduced himself to the kids so they didnt know what to call him. Overall, he did a great job and the kids had a blast! I would recommend him to a friend! Fabulous party, organized and engaging! I was a little sceptical considering I knew nothing about Bumbling Bert except from the Internet. However I was very happy with the way the event turned out. Prompt, engaging and adaptable. He modified the day to accommodate the kids and the whole event was a huge success. I would highly recommend Bumbling Bert and would love to book them again. Children had a great time, Bumbling Bert was prompt and fantastic engaging a large group of very excited little boys. Would definitely recommend . Awesome Magic Show, Balloons and Dance Party! My son's 7th birthday was fantastic! Thanks to Scott the awesome Magician/Entertainer! Kids had a blast and parents did too! Scott was such as natural with the kids and even took the extra time to blow up some balloons for those who had theirs popped! Thanks again Scott for such an amazing day for Hugh! We'd be hiring Bumbling Bert again for sure! bert thank for a wonderful time you were beyond our expectations, everyone had a blast ! We had a wonderful time at my 2yr olds birthday party I was a little worried with the age category of the children majority being under 5 and a handful over the age of 10 but Bumbling Bert did a fantastic job in making sure everyone had a wonderful time including the adults....at times i think they were having just as much fun as the kids if not more. Entertainer amazing!excellent interaction with kids! The entertainer was amazing as far as interacting with kids. Complete success.I would highly recommend him to anyone. Bert was Great. Great entertainer by far for the kids.. even made the adults laugh too. Would highly recommend! and Paula( behind the scene) was great to deal with as well. We hired Bumbling Bert for our son's 3rd birthday party and he was a huge success! We hosted 15 children ages ranging from 2-8 and Bert was able to customize and cater to each child in the room! His Magic Book is full of fun, great jokes and really creative skits! He had the kids up dancing and having a total blast! The balloon animals were fantastic and they also made a ton of other really unique items such as swords and hats for the children. The best hour of the party for sure. I would highly recommend this magician for any party! We were really pleased and our son had a blast! Bumbling Bert is the best children's entertainment i have ever utilized. I highly recommend their services when you can come to entertain children and then realize that the adults were just as entertained you absolutely have a great performer. Scott did an amazing job. The kids had a wonderful time. Scott had the kids attention from the moment he started until the end. This is the first time we hired a magician and was very pleased with the outcome. We will definitely keep you in mind next time we need entertainment for kids. Just had my son's 7th Birthday and Bumbling Bert did an awesome job of keeping everyone entertained!! (both young and old!!) He had us laughing as well as amazed at some of the tricks. Excellent with the kids and would definitely recommend to everyone. I have already passed it around to people planning corporate events next year!! Thanks Bumbling Bert - you were awesome! My daughter celebrated her 5th birthday. Bumbling Bert was awesome, fun, energetic, and great with the kids. The kids loved the magic show. My daughter was so excited to be part of the show. After the magic show the kids had the best dance party ever with lastest hit songs, flashing lights. My daughters friends are still thanking me for inviting them to the best party ever. Thanks Bumbling Bert we will tell all our friends and family about you. We will be seeing you again. The kids loved his show, and the Magic workshop was a hit with our crowd of roughly thirty 6-10 year olds. The goodies just kept coming during the Workshop section, and my little girl is still performing magic tricks for me from her 'stash' provided by Bert. Thank you for making our Halloween party such a great success! Bumbling Bert - Scott is the master of magic- 5 stars! Bumbling Bert put on a great magical show for my grandkids to entertain as a family birthday. He arrived promptly and soon had the kids sitting around enthralled. The finishing touch - animal balloons was a big hit and of a wide variety. Belly Laughing + Estatic Kids = Bumbling Bert...hands down! He captivated the whole party from the moment his car pulled in!!! The kids were hanging on his every word and laughing that amazing out loud laugh only kids can do!!! Your party goes to the top when Bumbling Bert is there!! The parents that stayed for the time were also very entertained and glad they stayed!!! Thanks for making such a great day even better for Stella!!! She has her balloon animal in a special spot...! Scott was absolutely fantastic! The kids were very engaged & talking about Bumbling Bert all week! Thank you for providing great family entertainment! The entire family will be riveted to the show and called upon to make the magic happen right in their own hands. Bert / Scooter are silly, zany and have a whirlwind of jokes and magic - but their kind hearts and good intentions will leave the crowd rooting for more! Bumbling Bert & Scooter Sparks are family-friendly, high-quality, uniquely flavored entertainers perfect for family-centered parties and events! Do you love the thrill and wonder of magic? I always have. I got my start as a child who was enthralled with magic. I would save my money to head to the Magic Store and buy great tricks to add to my collection. I loved performing for family and friends! As I got older, that wonder and thrill never left me. I still love performing as much today as I did then! I've owned my own entertainment company since 1988 and one thing remains the same: my commitment to bringing smiles and laughter to the faces of family and friends... but now they are YOUR family and friends. I live in beautiful Burlington, Ontario with my lovely wife Paula and four fantastic children. They think I have the best job in the world... and do you know what? So do I! My oldest son, Scott, also performs entertainment shows as well! When I first started out in business, I performed for several birthday parties each month and was shocked that I was being paid to do what I loved! These days, I put on over 350 events a year. Each time I am invited to be a part of someone's celebration, I still feel honoured. I'll bring everything but the audience! Thank you so much for attending! I wrote this in the review but wanted to tell you as well: All the kids loved the show! I will be recommending to all my family and friends. Hi Bert, Thank you for coming. The kids loved your act! Have a Merry Christmas! I want to thank you for such a wonderful dance. The students had a blast. Thank you so much for your services! The kids had a blast and we will definitely use you guys again! Thank you for the wonderful performance. Our Guests and Parents enjoyed it too! Thank you so much for your wonderful show! Both the kids and the adults really enjoyed you today. There was nothing but positive feedback from everybody!! Thank you! Everyone enjoyed your performance (parents included) and we will definitely keep you in mind for another event. Thank you! Merry Christmas. Thank you for the GREAT magic/balloon show. The kids and parents were truly entertained. I expect we will be calling upon you again next year for our annual Christmas party. Thank you again! Happy Holidays! The show was great. all the children were engaged and really enjoyed the show. Thank you for entertaining the children and coming all the way here in the heavy snow. Thank you, it was great. The kids had a wonderful time with you. They were engaged and had a ton of fun. Thank you, the event was a great success, the kids had an exciting morning and I also got great feedback from their parents. Just wanted to say thanks for providing great entertainment at Hannah's party today. The kids and adults had a great time and lots of laughs. Thank you for entertaining our children! Everyone loved your show! We really thought you were fabulously funny! My daughter was still talking about it this morning. Thank you very much for the wonderful entertainment on our Children's Christmas Party. It was such a fun time - not only for kids but also parents, including me, were enjoying so much as well. Magic was great, the talk and interaction with kids was great, music and surprise gift were super!! The whole entertainment was professionally done. I would recommend to anybody who is looking for fun time. Thank you very much. A very sincere thank you to you. All of the kids had such a great time with you and you held their attention really well considering you had several ages to deal with. ​You made the birthday boy feel extra special. He said that your show was the best part of his party. We will not hesitate to recommend you to all of our friends. A big thanks to Paula who was always very quick to respond to any inquiries that I had prior to the party. She was extremely nice to deal with and provided great customer service. All in all, a great experience. Thank you for such a wonderful show today. Everyone loved it!! Payton wasn't feeling very well today and you were incredible at getting her to participate. It was amazing. I'm sure we will be booking you again! My son's 5th birthday party was a success thanks to Bert. It was the first year we went all out and invited over 20 kids. The pressure of party planning was off as I knew I had entertainment covered because Bert was highly recommended by a close friend. The kids had a blast and the look on my son's face made it worth every penny! The loot bags were awesome! Better than I expected. The parents of our guests were also impressed. It was great. Best party ever!!! It will be hard to top next year! The experience you offered was amazing for all of us, not just for the kids. Thank you for being such a great entertainer and filling the whole hour with magic and excitement. You did not rush through it and your enthusiasm was what we had hoped for! We will definitely keep you in mind for other events, as I'm sure others there that saw you will too! Thanks again for the great communication and accommodating during our planning! We had a great time this afternoon. I thought it would be challenging to entertain a group of 5 yrs old boys AND a group of 9 yrs old girls, but your son did an AMAZING job!!! Everyone really enjoyed the magic show, the girls' favorite part was dancing and the boys fighting with their balloon-swords. Thanks so much for contributing to our kids birthday party and making this day filled with joy and laughter! I wanted to have my son's 5th birthday party at home rather than in a play area but I was worried about finding good entertainment (didn't want my house destroyed by 17 5yr jumping from the couches thinking they are all Spiderman). Bumbling Bert was highly recommended by a friend and so I called him to find out about his show. He's been working as a magician for years and has truly mastered magic. He also has excellent people skills. He read my crowd of Spiderman-wanna-be's really well and put on a excellent show that kept the kids (and parents) entertained. I would without a doubt recommend Bumbling Bert for 5-105 year olds. Bumbling Bert's wife Paula sent me a booking confirmation right after I booked and was very punctual with all of my questions. Thanks Paula and Bumbling Bert for making my son's 5th birthday magical! Thank you Robert, (Bumbling Bert) - the kids had a GREAT time and I had to do nothing except keep them away from the chips! See you again! I can't thank you enough for the awesome job you did!!! The kids are still laughing about it and happy! Mr. Robert, thank you for the Magic Show everyone loved it. Thank you very much for an awesome time. All the children loved it! I will be recommending you to my friends and family. A big thank you for a wonderful performance, the kids had a blast! We found Bert after a lot of research and reading several reviews we decided to book him for our daughter's 2nd birthday. I was worried about the birthday girl, who isn't always receptive to new faces but she had a blast which was nice to see! All the kids had a great time and our little princess even received a tiara which was a nice touch! Thank you so much! The birthday boy keeps asking when you're coming back!! Thanks for a fabulous magic show and dance party!! A few parents requested your card, which I provided to them. I also left cards with the party planning staff at Fortino's so hopefully you will get even more business! Everyone at the party was extremely impressed with you! Thanks again!! I just want to thank you for making everyone's day yesterday. All of our participants enjoyed your enthusiasm, music and magic show and continued to speak of you for some time after you left. We will definitely be in contact with you for future events. They are all still doing their Magic Workshop Tricks this morning!!! Had to call a few times to get them to come for breakfast.. too cute!!.. definite recommendation!.. thank you again.. sincerely. I just wanted to email you and say THANK YOU!!!!!! What great party we had. All the kids had lots of fun. My boys we very happy! Scooter Sparks is so, so sweet!!!! We loved him. Thanks again for everything. Dear Paula and Bert, it was a magical show on Sunday! We were all amazed and amused! Thank you very much for your talent and patience with the kids! Sincerely, Leo's Family and Friends! Everyone, including the staff loved your performance! They loved the high energy, the bubbles and dancing to current music for the children and the magic tricks. They especially loved that you were very different from the normal entertainers we have here. We look forward to having you back next year! We loved the Magic Show!!! Thanks again Bumbling Bert! My daughter said you made her party her best birthday ever. Really appreciate it. Thank you very much. Hi - Thank you for everything. The kids enjoyed your show, they had a lots of fun... even the parents! We were so happy to see the kids wearing balloons as a crown. Thank you again. See you again at the next event. The thanks is alllll for you. The kids had a BLAST! And the parents who normally are running after their kids to manage them basically had nothing to do - your entertaining was so thorough!! I will absolutely be hiring you again at our next party! I'm so lucky I found you! THANKS SO MUCH. Thank you for providing a fun filled music / dance adventure for our children. The children really enjoyed the party! See you next year again! Thanks for an awesome evening. The Street Party was a success and will definitely repeat Movie Night next year! Thank you for a wonderful time yesterday. Everyone had a blast, kids and adults alike. You were super professional, on time, patient and accomodating with a difficult crowd, being such a diverse age group. Most importantly, you were A LOT of fun! Thanks again and I would not hesitate to recommend your services to anyone wanting to have an unique an memorable party. Thank you very much for making Sarah's birthday special! All the kids had a wonderful time. You did a great Show! It was funny and entertaining! I will definitely recommend you to all my friends. You were so fabulous!!! Nicholas said this was his best birthday ever! Thank you sooo much for being so great! You were awesome Scooter Sparks! Thank you so much, Marshall LOVED his party and so did the adults. Claire said this morning, “That was the best birthday party I ever had. It was way better than I ever imagined....”. The kids had a blast and I had the easiet hosting job ever. Thanks again for making the event so much fun and easy!!! Our first experience with Presswood Entertainment was when we saw the magic show during the Maple Sugar Festival. We hired Scooter Sparks for our son's 4th birthday party at his Montessori School. All of the kids greatly enjoyed the show, as was evident by their smiling faces, laughter and increasing volume level as the show progressed! The teachers and other adults present all wanted Presswood Entertainment's business information for future bookings - in all their years of education, they said it was the best entertainment show they have ever seen. We agree! Hi Bert and Paula! Great party! Thank you so much! I loved the dj part the best! Thanks for making the party so entertaining - everything was great and a great control over the kids and their attention spans! I think I will start planning parties so you will definitely be my magician /dj!!! I love parties! My son said it was the best party ever so I'm happy you helped make that come true! Dear Bert, Thank you so much for Saturday. The kids had a fantastic time! Hope to see you next birthday party! I wanted to send a quick note to let you know how much FUN was had by all the children in attendance at Rheanna’s birthday party. Scooter Sparks was nothing short of GREAT! The children delighted in his magic and theatrical ways. He was quite connected with the group. All of the parents asked where he came from and thought he was fabulous. One mom told me that he “ROCKED”! So glad he were able to have him come all the way out to Brooklin. I never hesitate to offer your services both professionally and personally. Please pass on my appreciation to Scooter Sparks and for a job WELL DONE!! My son had a wonderful time and just as you said the adults were amazed!! Job well done! Thanks so much for yesterday everyone had a wonderful time and a few mums have already requested your details! With your help Rishaan's 2nd Birthday party turned Great great fun. Kids enjoyed a lot, they are still talking about awesome time they had. Kids parents are already inquiring about you. I'm so glad that you came over. Definitely looking forward to see you next year for more n more fun. Can't wait for another blast that you will host for next year. Thx so much from Rishaan’s whole family. Just wanted to thank you guys again. That was my first time seeing Scott and I must say he did a fabulous job! Really awesome with the kids and adults! Funny, flexible and talented! He really made Grace feel special! Thanks again! Louis and I wanted to thank you for being incredible, fun, entertaining and surpassing the already high bar we had set for you. You were wonderful. Your rate is very reasonable for the immense pleasure you brought to the children and we adults. We look forward to using you again and again. Thank you Bert, the kids had a fantastic time!! Hope to see you on our next birthday party. Kids had a blast! Thank you! Hi, Robert, Paula and Scott! We just wanted to thank you for putting on such a fantastic show for Tyler and his guests today. Bumbling Bert did awesome job to interact with all the kids with his great sense of humor. The kids went on and on about the magic tricks and funny jokes afterwards. It was a blast! Thank you very much for your great work, Scott! Thanks for the great show! It was enjoyed by the kids and adults alike! Thanks Robert. You did SUCH a amazing job... Joshua and all the other kids just loved you and so did we :) Will definitely be using you again! Take care. I am so grateful that you were able to come to Sofia's first birthday party. All of her guests, young and old, were very happy. My mother-in-law said "it's not just for the kids....for us too!" You were funny, engaging and very magical. Thanks again for adding excitement and laughter to our party. You were a definite hit!!! Thank you so much for an amazing performance on Friday at Lilianna's birthday!! The children had a blast as did the parents! The glow sticks were an extra special surprise and made the dance party that much more exciting for the chidlren. Everyone had nothing but positive comments to make. Many parents have asked me for your information as well : ) Lilianna said it was her best birthday ever and she wants to do the same thing next year!! You really have a special gift in working with children and making them smile! Thanks again for everything!! Amazing time!!!!! You rock!!! Bert thank for a wonderful time you were beyond our expectations, everyone had a blast! It was my pleasure to have you to entertain the kids! Everybody loved your show & so many other families have been asking me for your contact info! Thanks again! Bumbling Bert was great and all the kids loved him! Thank you for the wonderful party for Callum! You really surpassed my expectations, there was so much variety. Everyone had a terrific time! You are fabulous at entertaining the kids. I would highly recommend you to anyone who wants a successful party with lots of fun and laughter. Again, thank you so much for making our party such a hit! Thank you Bumbling Bert, the kids had a lot of fun! Again! Just wanted to send you a quick Thank you note! The kids had a blast. Bumbling Bert was FANTASTIC!!!! He was friendly, entertaining, and very talented!!! I can't believe he even managed to make a 'creeper' on the fly! Awesome job. My little guys are still playing with their balloons. Thank you so much for coming! Fantastic job...everyone had so many postive comments! thank you again!! We look forward to seeing you again next year! We were very impressed with the magic show and the tricks that were given to the children. We have already recommended your entertainment to our friends! We had a rambunctious group and Bumbling Bert handled it with patience and humour. Thanks for making Wyatt's 6th Birthday a memorable one! Thank you so much for coming, the kids had a blast. A lot of parents said you were great and we gave them your business card! A+ show. The kids enjoyed the fun magic show and dance party! My daughter celebrated her 5th birthday. Bumbling Bert was awesome, fun, energetic, and great with the kids. The kids loved the magic show. My daughter was so excited to be part of the show. After the magic show the kids had the best dance party ever with lastest hit songs, flashing lights. My daughters friends are still thanking me for inviting them to the best party ever. Thanks Bumbling Bert we will tell all our friends and family about you. We will be seeing you again. Bert has great energy :) A room full of kids, and he managed to entertain every single one :) The kids loved his show, and the Magic workshop was a hit with our crowd of roughly thirty 6-10 year olds. Bert was a delight to deal with before the show, very professional in his set-up, and really wowed his audience :) The goodies just kept coming during the Workshop section, and my little girl is still performing magic tricks for me from her 'stash' provided by Bert. Thank you for making our Halloween party such a great success! Bumbling Bert was great - especially how he interacted with the kids! The parents who were at the party thought Bert was funny and kept all the kids from ages 2 to 9 entertained. We all loved the dance show - especially the conga line! Thanks again I will be sure to recommend you to other parents. Additionally, the customer servuce you have provided before and after the party has been very good. It's nice to know someone cares about the service they provide. Many thanks again! The Halloween Party was amazing. Thank you! Many, many thanks for helping us celebrate Maplehurst's 100th year Anniversary.E veryone enjoyed the day and the families and kids loved dancing to the music. Thanks for all your flexibility and patience and efforts. The kids loved the magic show and the magician! The dance party was a blast! Thank you! We had Bumbling Bert for our son's 4th birthday party, and he did a great job entertaining fourteen 4 year olds. The kids found him hilarious and he kept their attention for the entire hour - amazing! Content was age-appropriate and the balloon animals at the end were a big hit. I would highly recommended Bumbling Bert's Magic Show. Thanks again for making James' party such a success. The children enjoyed the two shows very much. I could hear them laughing down the hall while watching and taking part in the magic show. The children also loved the dance party! The music was great and allowed them all to participate. Thanks! Bumbling Bert was terrific, he had all 40 of our energetic children's attention for the entire visit! What a great way to end a terrific summer camp program! Bumbling Bert had as much energy as the lot of them did! Thank you so much and we'll see you soon! This was a wonderful experience for all ages, the children had an amazing time. It was a truly interactive experience and keep the children entertained for the whole hour Bumbling Bert was here. Days later they are still talking about it!! Thank you so much for one great, fabulous entertainment. Our parents were so happy and most of all our kids. What a way to end our park program. We were very impressed with Bumbling Bert. He was great with the kids, made them laugh almost nonstop and was excellent at getting them involved. He was punctual and great communication before the event so we knew exactly what was happening. We would not hesitate to recommend him to other businesses. Thank you again for the great show. There was never a dull moment! All our guests had a blast, kids and their parents too! My 4-year-old daughter, who was the celebrant, is very shy in general, but Bumbling Bert just brought her out of her shell and made sure that she had a ton of fun. He made sure that she felt like she was the star, and to be honest, I have never seen my daughter that happy and comfortable with someone that she just met. My husband and I are very happy with the whole performance. It was definitely the highlight of the party, and even the grown ups were talking about the show and how funny Bumbling Bert was! I wouldn't think twice having him again at our future events. The children had the blast…we’re definitely doing this next year!!! Thank you again! Every time Presswood Entertainment comes to our centre for a show I remember why we book them........they are INCREDIBLE. Our children love every second of every show. The staff and the children have soooooo much fun. Thanks for another great summer of Bumbling Bert! 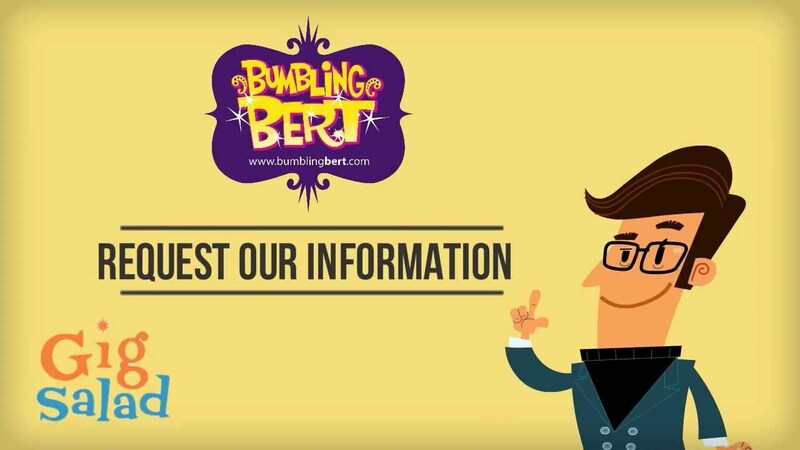 Thank you so much for sending Bumbling Bert on August 8, 2013 to be the Host Entertainer for our Family B.B.Q. Children and parents loved him. Bumbling Bert was amazing there are no other words to express the excellence of his job. Our Family B.B.Q was successful! Once again, the children and staff were entertained by the wonderful Bumbling Bert! The kids were laughing from start to finish and loved every trick! Thank you for another great show! Our show with Bumbling Bert was amazing......funny, magical and very entertaining! !The children of all ages (as well as the staff) laughed, danced and were “amazed” by his magic tricks. Would highly recommend! Bumbling Bert was an incredible part of our day! His humour and sponteneity was very engaging for kids and adults alike. Thank you so much for coming - the kids had a great time! I just had the pleasure of having "Bumbling Bert" perform for our daycare. He was funny, engaging, and very in tuned to the children! Everyone had a great time. We have children aged 4-11 years and we broke them up into 3 very large groups. He was able to manage and adapt to the ages of all the children, and it was delightful for all! Thanks for the show! It was GREAT! Thank you so much for a fantastic morning. Bumbling Bert was the highlight of our summer so far......they children are already asking when we can have you back! Thanks for another great presentation, we can always count on a fun filled hour with Presswood Entertainment. We had a great time with Bumbling Bert and his Boogying, Bee-Boppin, Bubble-Palooza!! The children AND teachers were all having a great time!! We would definitely recommend Bumbling Bert to anyone, and will definitely be having him come back to visit again! experience the children will remember for a long time. The bubble dance party was a huge hit! Thank you so much! The kids loved the show, tons of laughing. He had great interaction with the kids. Birthday girl was really happy. Money well spent. We aren't sure how he does it - putting up with a bunch of over sugared kids! The show was great! Bumbling Bert was amazing. Children showed tremendous focus and paid complete attention while he was doing tricks. The room was full of laughter. Children were learning and enjoying at the same time. Bumbling Bert grabbed each and every child's attention at all times. He let some of the children participate during his tricks that made the children more excited, interested and kept entertained. He showed enthusiam and humour and was full of fun. Children loved the Dancing Party and we ALL participated in the dance. It was wonderful! I could tell the children enjoyed the show! See you next month! Thank you SO MUCH for the wonderful magic show presented to the preschool children at Kids Haven. The children delighted in laughter and the staff were very impressed. Job well done!! I will look forward to your next show in August. Bumbling Bert is more than simply a magician. He is a magician, comedian and DJ rolled into one. In short, he is a one man entertainment team! All of my guests, young and older alike, thoroughly enjoyed the show and the bubble dance party that followed. Bumbling Bert certainly helped to make my daughter's birthday a memorable one! Bumbling Bert was wonderful entertainment for all ages of children. The children and staff had lots of fun for whole 45 minutes. It was great! Thank you Bert for a great show. 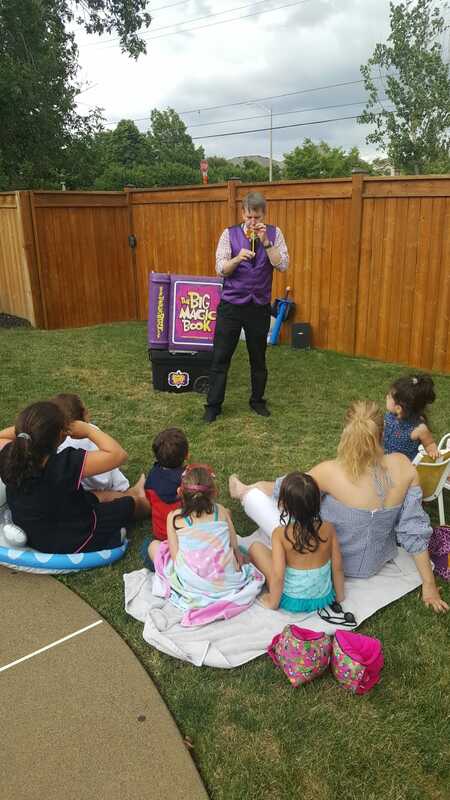 Bumbling Bert’s Magic Show and bubble machine were a big success with the children and their parents at our Company’s Summer Barbecue. You could see by the look on the faces of the children as well as the teens, that they completely enjoyed the tricks and hilarity. Offering the wee ones a balloon animal was a nice touch at the end. Thank you very much for an entertaining show. To all the parents out there-Wondering if you should hire Bumbling Bert-You DEFINELTY should. My two year old son and his friends were extremely excited with Bert’s friendliness. Bert walked in to my party and greeted all the children before he even started. There was also an added feature of a fantastic addition-the bubble machine. All the toddlers were thrilled. The show itself was mesmerizing and all the children laughed and were involved. Overall great addition to any party. The children danced and left happily with their balloon twisted animals. Bumbling Bert and the Big Magic Book is a creative, enticing and interactive show for kids and adults alike! All in ear shot are entertained and thoroughly enjoy the show. Bumbling Bert is easy to work with and will make any event a success! The Preschoolers had a blast at the glow-in-the-dark dance party. Robert was a great DJ, he got all the children on the dance floor and played amazing music. It was a fantastic party for the Kingergarten group and the School-age Group said they had a great time! The kids had a blast and they cant wait for the next event. Robert, thank YOU for an amazing magic show and making Caledon Canada Day fun for everyone there! I definitely look forward to working with you in the future! Bumbling Bert came to our daycare for the bubble dance and magic show. We had about 80 children ranging in age from one year old to six years old and all of the children loved it. The music the bubbles and the silly magic tricks kept every age entertained. The children thoroughly enjoyed the show and just as importantly the teachers had just as much fun. We are looking forward to having Bert back next year! We would be more then happy to recommend you to everyone. As the children are being picked up just now they are all telling their parents about it. Bumbling Bert was great...our children never laughed so much! What can I say about our dance party with Bumbling Bert? WOW! It was so much fun. All the children and staff absolutely loved the time he was here. The children are still talking about it. We would definitely have him back to our centre. Music was great! Games were fun! Lots of bubbles which the toddlers that came out could not get enough of! Thank you so much for being able to accommodate us on such a short notice. I am so glad I got your flyer in the mail! e were most impressed with your performance. Your patience and understanding of our kids was evident. The pace of the show was perfect!! Thanks for making our party so memorable for the kids and families we work with!! The Magic Workshop was highly entertaining and very funny! The children loved learning new tricks and even got to take a bag of magic tricks home. We had a great time! Thanks! My 4 year old and I really enjoyed the magic show - best live child entertainer I have seen ever! We LOOOOVED the show and through Robert was terrific. Kids really enjoyed it and were very impressed by his tricks. We had a wide-range of ages and everyone just loved the show! Bumbling Bert was great! 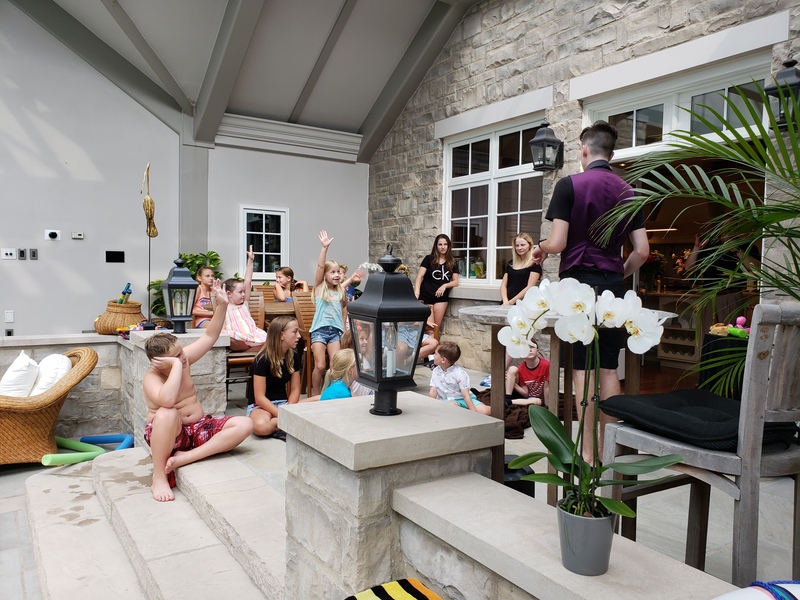 We had over 28 kids at my son's 5th birthday party and we were so impressed by how Bert managed to keep them focused, entertained and laughing out loud!! A great success and the kids are still talking about him!! Bumbling Bert entertained our kids' hockey team at their end-of-year party with dazzling magic and hilarious comedy. A great way to end our season!! We were so impressed once again with Bumbling Bert…from stepping in at the party he started to engage the kids. He was funny, patient and kept the party going. We look forward to having him as a guest again in the future. I just wanted to thank you again for a wonderful birthday party! Everyone enjoyed him so much!! Several parents came up to me to appreciate how good his show is, how patient and enthusiastic he is with the kids. It was a great success! Thank you and all the best! Oh my goodness Robert! I have never been so entertained! Sam and I laughed so hard, you are incredible and your show was amazing!!! Juliana said it was her best party ever because of you. I loved every minute of it and so did my guests! We put all your stickers and cards in each loot bag. We are still chuckling at some of your lines and wise-cracks lol esp when you would shout angrily (joking) at the kids lol lol. You'd fit right in with our loud Italian family. Even my 15 and 19 year boys thought you were so great!! Thank you again for a great show. Bert had our bellies bumbling over with laughter. Both adults and children had a terrific time. That gumball trick was out of this world! How do you entertain and keep 20 kids engaged for an hour? Simple, a Magic Wonder Show by Presswood. Why did we use Presswood Entertainment for our wedding & 9 years later for our kids birthday party? Because it’s a hit with the kids!